A newsletter from the mind of Yasha Levine: Internet history, California oligarchs and billionaires, former Soviet Union politics, US-backed Nazis...and more. They escaped state-backed antisemitism and bigotry, yet they now pump out stories that reproduce the same kind of deadly xenophobic fairytales that have long been leveled at Jews. Last week I wrote about the xenophobia that underpins so much of today’s freakout about “Russia” and “the Russians” — a panic that isn’t coming from the bottom, but from the very top of America’s liberal media class. And one thing that’s really bothered me is the role that Soviet-Jewish emigre journalists have played in feeding and normalizing this xenophobic hysteria. Instead of calling attention to it, challenging their colleagues’ bigoted assumptions, or at least refusing to participate, most of them have gone all in on the racket. 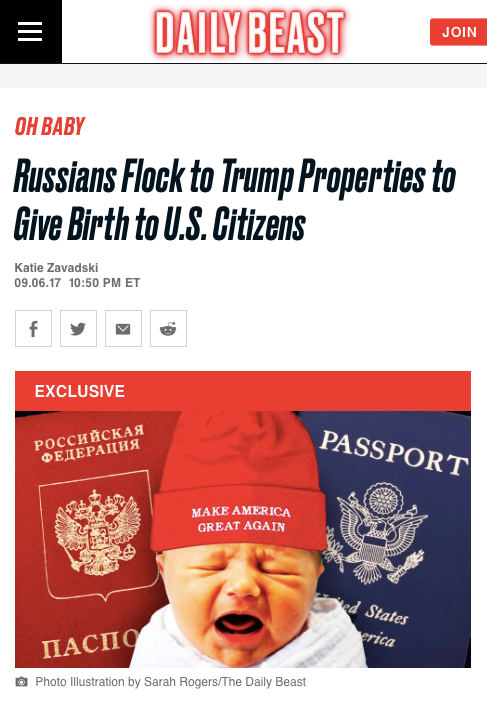 For years, these journalists used their credibility as “natives” — as people who are from “there” and know “the Russians” better than anyone — to spin frightening tales about this “threat from the east,” hyping Russia and the Russians as a danger to everything that liberal westerners hold dear. Looking back on the last decade, it’s clear that they have helped seed the ground with crude Russian tropes and stereotypes and prep American culture for the bigoted media-driven hysteria that dominates it today. And they keep doing it — all to the benefit of their careers. Take this recent Time magazine cover story. It ran just a few weeks after Special Counsel Robert Mueller took the air out of the Putin-Trump conspiracy bubble. 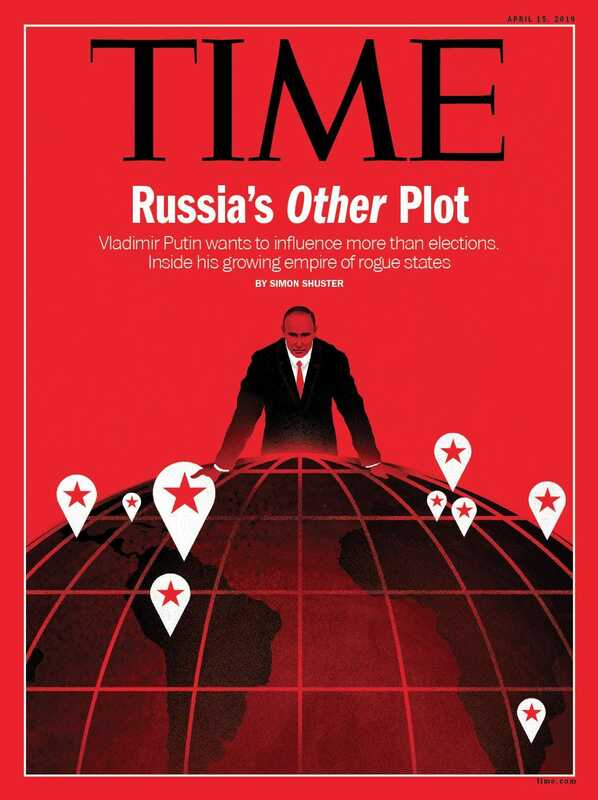 And with its blood-drenched “Judeo-Bolshevik Lite” aesthetic and hints about other diabolical Russian conspiracies to control the world, Time sure wasn’t going for subtlety: Sure, that plot was a dud, but the liberal global order shouldn’t let its guard down just yet. There are other plans afoot, ones more expansive and possibly even more evil! The particular other plot it references isn’t actually a plot at all, but a dramatic, hyped up description of Russia’s rather bland foreign policy, which aims at making and maintaining alliances wherever possible — from Venezuela to Syria to Sudan. It’s the kind of boilerplate threat-inflated reporting you’d find in a Reuters or AP wire dispatch. The article is unremarkable. What stands out, though, is Time magazine’s unapologetically xenophobic imagery. The man on the cover might be Vladimir Putin, but if you squint at him just right (and, really, you don’t have to squint very hard at all) you can see the outlines of the Demonic Jew — aka the Judeo-Bolshevik, aka the Elder of Zion, aka the Red Beast, aka the Asiatic Commie — surveying his global conquest. It’s a classically antisemitic image. You can find propaganda posters in just every European language from the last 100 years depicting Jews (especially from the territories of Russia and the former Soviet Union) in exactly this manner: menacing, evil, degenerate, disfigured, non-human — greedily straddling and clawing at the world. Putin of Zion fits right in. Antisemitic imagery grafted onto modern Russia? Yep, that is what’s going on, and there’s actually whole racist history and logic behind it. As Paul Hanebrink shows in his recent book, A Specter Haunting Europe: The Myth of Judeo-Bolshevism, the Judeo-Bolshevik conspiracy theory (which postulated that Jews created and then forced global communism on the world as part of their eternal plot to subjugate humanity — an idea that Nazis and most European fascists and anticommunist reactionaries promoted and took as gospel) began to lose its overtly antisemitic imagery and language after the end of World War II. As former fascists and Nazi collaborators refashioned themselves into anti-communist democrats, Judeo-Bolshevism morphed into a more “respectable,” but still virulently xenophobic theory that that took out “the Jew” but still equated communism with a barbaric, asiatic, godless threat from the east. In other words: the overt antisemitism disappeared, but the bigotry remained. 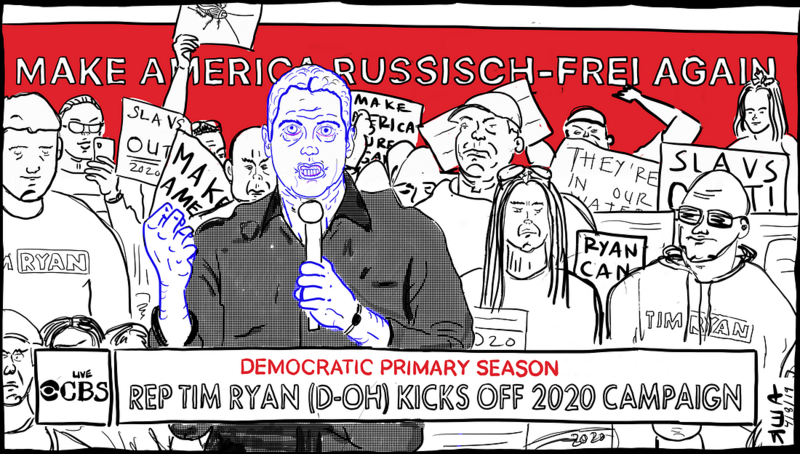 Over the last fifteen years or so, as Russian-American relations degraded, this “more acceptable” anticommunist xenophobic theory was resuscitated and grafted onto a capitalist, oligarchic Russia. These days the Soviet Union (and the threat of communism) has disappeared, but the racist tropes about its people and culture have not. 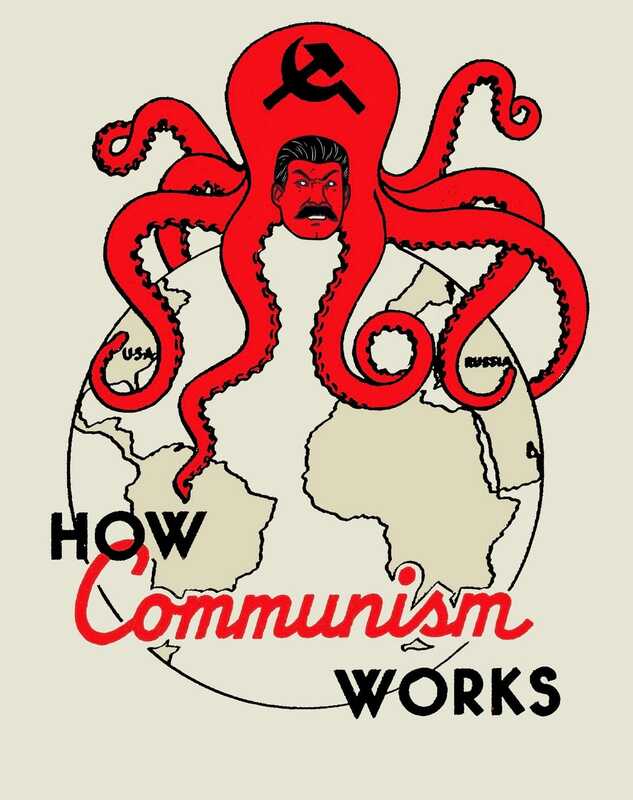 Without communism what’s remained is pure imperial xenophobia: a manufactured fear of a diabolical “other” from a mythical barbaric east. After Trump’s victory, this reheated and repurposed antisemitic conspiracy theory took center stage in elite liberal circles, shifting blame for America’s domestic problems away from our degenerate ruling elite onto a fictitious, inscrutable foreign enemy that was infecting “our” society. This fear went way beyond just Russian government and has been expanded to include “the Russians” and anyone thought to be connected to “them.” That of course ensnares and puts under suspicion all kinds of Soviet and Russian immigrants and Russians — people like me, everyone from my family, and tens of thousands of others like us. We’re all possible traitors — even Soviet pensioners living in America are suspect — very likely taking orders directly from Putin, Russia’s Queen Brain Bug, himself. I can’t count the number of times I’ve had to deal with this. And that’s what makes this Time cover so depressing. It was written by a Soviet-Jewish emigre: Simon Shuster. He came to the United States as a kid, like me. Chances are that, like me, his family faced extermination during World War II and then left the Soviet Union to escape state-backed antisemitism and bigotry. Yet here he is working for a prestigious American magazine and signing his name to a story that reproduces the same kind of xenophobic tropes and conspiracies that Jews have long had to endure, and that his family tried so hard to get away from. I don’t know Simon personally, although people tell me we went to the same high school in San Francisco — him a few years behind. We grew up in similar circles and know the same people and probably lived not far from one-another. But I honestly have no idea how he signs his name to this racist garbage. Well, actually, I think I do know how he does it. One thing I know about American journalism is that, despite all of its platitudes about free speech, it’s a highly regimented, corporate culture that allows for little dissension. For Simon to push against this bigotry would have been deadly for his career. He would have been branded a Putinist, a traitor, an authoritarian-lover — all of which are things that I have had to deal with. He certainly wouldn’t have climbed as high as he did: in his mid-30s, heading Time Magazine’s Berlin Bureau. That’s what you do as a foreign correspondent for mainstream American publications: you faithfully reproduce the State Department line. You do what’s expected, and you don’t question things — at least not publicly. If you’re covering Russia, you help push xenophobia and ratchet up the fear. If you’re covering an recent ally like Ukraine, you whitewash and downplay the dirt, even if it means engaging in Holocaust revisionism — like he does in this grotesque profile of one of the scariest fascist leaders behind Ukraine’s Maidan putsch, Dmitro Yarosh. It’s gross, but that’s what it takes to succeeed. But protecting your job, pleasing your editors, making sure your career moves forward — these aren’t excuses for promoting bigotry, especially when you’re a Soviet Jewish refugee. American reporters love to mock journalists who work for Russian state news outlets because they’re seen as cynical and subservient — they faithfully report the Kremlin party line, even if they know better. But how is this any different — especially when the bigoted conspiratorial “reporting” you get from magazines like Time has become almost indistinguishable from the the xenophobic fear mongering you frequently see pushed by Russian state news media? My wife Evgenia, who was born and grew up in Moscow, is constantly shocked by how similar they’ve become. Of course, Simon is not alone. 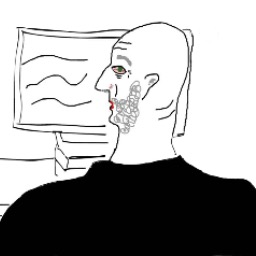 He seems like a nice guy, and he’s a decent reporter. But he’s not very remarkable. As far as Soviet Jewish emigre journalists go, there are other, much worse offenders. People like Masha Gessen, Julia Ioffe, Peter Pomerantsev — just to name a few of the ones who’ve done the most damage. Like Simon, they left the Soviet Union with their parents to get away from antisemitism and repressive state control. But in the free West, they‘ve built their careers on pumping out xenophobic stereotypes and crude propagandistic reporting for the benefit of the American Empire. It’s not surprising. That’s the kind of work that gets rewarded here. That’s what it takes. A Russian acquaintance of mine called people like them “Court Russians” because they so faithfully serve America’s imperial interests. And he’s right. Top image copyright: Yasha Levine.